How and why did Marseille get so famous for its soap? First of all, let me ask you, what are two essentiel ingredients needed to make soap? You need soda and salt. Soda (sodium carbonate and sodium hydroxide) combined with a vegetable oil, creates the base of a Marseille soap. During the heating process impurities can arise. Salt water is washed through the mixture several times for the cleansing. The Camargue region (salt water marshes) next to Marseille, provides for both the soda and the salt. To have sodium carbonate, the plant known as La Soude (Salsola soda) from the Camargue salt marshes are burned. The ashes of this plant contain up to 30% of sodium carbonate. Then of course, you have Marseille, a major port along the Mediterranean that had been key in trading ever since the Greeks arrived in 600 BC. Put the well established trading port together with the natural environment providing the raw materials and you have the beginning of the Marseille soap story. 1688 – Louis the 14th laid down the rules which institutionalized Marseille soap. 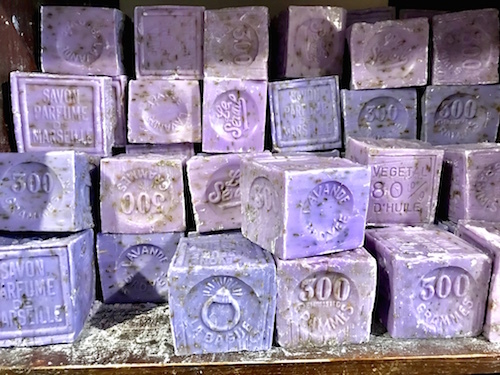 18th century – the Marseille soap became more than just a regional product. Sea trade began and it was being shipped all over the Orient and Mediterranean basin. 19th century – progress in hygiene, technology, railway infrastructure, and advertising continue to expand the demand of Marseille soap. This was the “golden age” and lasted until the beginning of the 20th century. 1940’s – The steady decline started. A lot was due to the production of synthetic detergents, people using washing machines (instead of washing by hand), the set-up of supermarkets where people coud easily buy other products. The 70’s & 80’s – a return to natural and ecological values, Marseille soap becomes popular again. Unfortunately, the rebound will never be back to what it was during its golden age. In 1924 there were 108 soap manufacturers in Marseille and 14 in Salon. 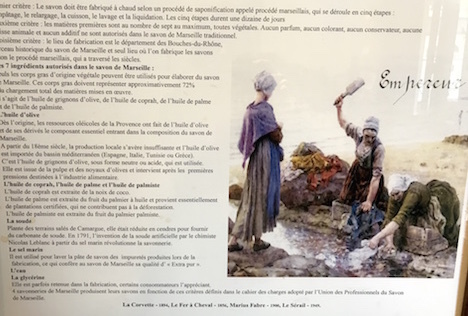 Today, there are four companies still making Marseille soap the traditional way: Le Fer à Cheval (1856) La Corvette (1894), Marius Fabre (1900), and Le Sérail (1949). How do you know if you are buying the authentic Savon de Marseille? The very first « Marseille soap » was made only with olive oil. Napoleon, in 1812, adopted a decree defining the shape of the soap (a pentagon) and the words « olive oil », the manufacturer’s name and the name « Marseille » stamped on the soap. In 1927, Marseille soap was redefined as a product made exclusively from vegetable oils (palm oil or copra oil could be used instead of olive oil). Why did « other » vegetable oils get authorized? Believe it or not, there was not enough local production of olive oil for the demand. There is 5 step process (traditionally using a cauldron) – these five steps take about 10 days. When you go out to the local markets here in Provence, you will undoubtedly find many soaps to buy. Most of them will be with coloring and perfumes (or sometimes essential oils). You can ask the vendor where the soaps were made. Most, but not all, will be made in the Provence region. It might even be made in Marseille. These soaps can be referred to as « Soap from Marseille ». 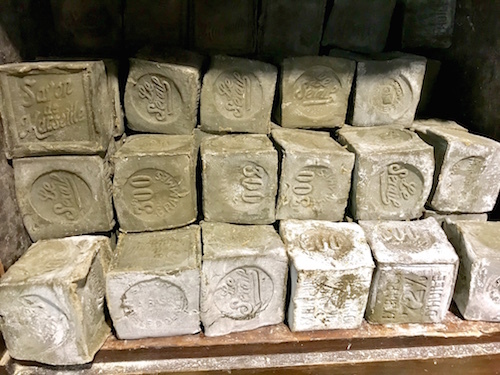 But if you are looking for the « real » Marseille soap, « Savon de Marseille », you must remember that it will be either green (made from olive oil) or white (made from palm or copra oil). Traditional Savon de Marseille will not be purple and smell like lavender. 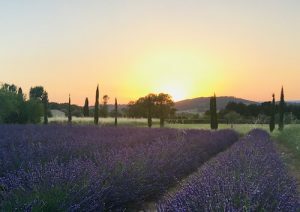 The lavender will be in bloom and you’ll be staying in the quaint town of L’Isle sur la Sorgue where you can buy your Savon de Marseille and many other treasures such as lavender bouquets and Provencal linens at the Sunday market. Yesterday morning, while walking the ancient Roman road near my house in Cavaillon I stumbled upon more than ancient ruins. Not just one, not just two but a handful of lavender plants here and there. Surrounded by pine trees, thyme and limestone blocks from the Roman quarry I couldn’t help to marvel at this hidden lavender holding on to its fading purple flowers as if to give the curious wanderer one more treasure before winter arrives. On my hike, that I have often done but never guided by Annie Gaudin, historian at the Cavaillon Heritage Museum, I put together the pieces of my puzzle.